The Shelco BFC-2SB Carbon Steel Single #2 Bag Filter Housing provides exceptional water filtration by utilizing a single standard #2 bag filter for flow rates up to 150 gpm. 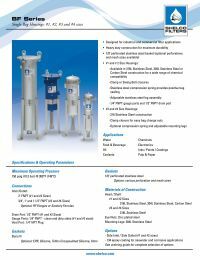 The swing bolt closure allows for secure sealing and quick and easy filter bag changes. NOTE: Standard option BF series housings are stocked and available for immediate shipment. Customized housings require 2-3 weeks to manufacture. For more information on returning customized items, see our Returns Policy .